John Maxwell (jmax@sfu ca) is interested in how technological change impacts book and periodical publishing, in the history of publishing, and in the emergence of digital forms, genres, and mythologies. John has been working on the Web since 1993. Since then, he’s been working on content management strategies, electronic publishing, SGML & XML, learning technologies, virtual communities, and reflecting on the history of all that. John was a member of the first Master of Publishing cohort at SFU in 1995/96. He’s worked with Canadian book and magazine publishers on digital strategies looking forward, and also on the history of tech innovations in publishing. 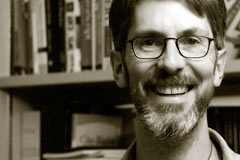 After working on educational technology at the BC’s Open Learning Agency through the late 1990s, he took a PhD in Curriculum & Instruction at the University of British Columbia where his research focused on the cultural history of personal and educational computing at Xerox PARC in the 1970s. John has taught in the Publishing Program at SFU since 2001, and became the Director of the program in 2014. He currently teaches the MPub seminar PUB800 – Text & Context and the undergraduate foundations course, PUB101 – The Publication of Self in Everyday Life. John’s current research involves the evolution of the scholarly monograph, the digitization of SFU Library’s 16th century Aldine Collection, and historical research on digital innovation at Toronto’s Coach House Press in the 1970s. See our Research Activities page for more details. John is a board member with the Alcuin Society, and he teaches a course on Text Processing Techniques & Traditions at DHSI each June. Technology, Digital Media, History of Publishing, History of Technology, Content Management, Policy, Copyright.